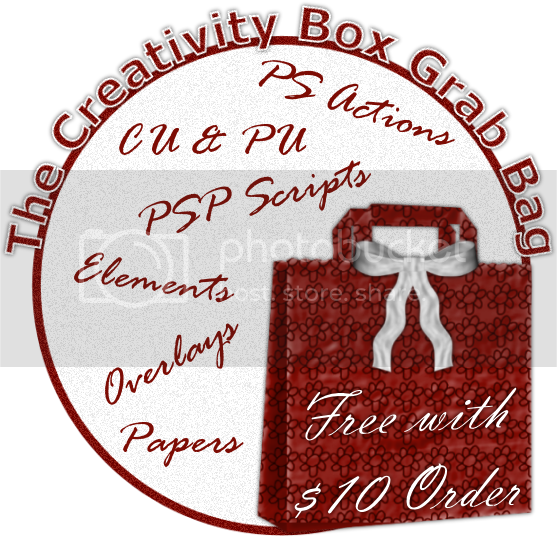 The Creativity Box has his first CU Grabbag for FREE!! it contains multiple stuff you sure can use! 3 actions, made by Scrap Starry, Stacie Cakes & Aquarius Design. Multiple overlays by Deb's designs, Diva designz, Joyfull Moments designs, Lisa's designs, Reeces Pieces and Heart of essence. Loads of other elements by Donna's Scrappin Designz, Joyful Moments Designs, Lisa's designs, Meadowsong, TammyJo's creations, Heart of essence and Heartbeatz Creationz. Do keep in mind that half of these items are only for taggersize kits. So get you but in gear and go to www.thecreativitybox.com and get that bag for FREE. This seems to be a great kit but when I tried to check out, I got a message that I needed to buy $25 worth of stuff instead of $10. I've written an email but I thought anyone following up on this might want to be aware there's what I'm sure is a temporary blip in the offer. Never mind.....you have to put the grab bag in your cart and THEN apply the coupon. I missed a step. Sorry. I'm not having a very good morning.